Goldenberry lives up to its name. The small saffron-colored marble-esque berry, with the texture of tomatillo and taste of tangerine, is generating waves of demand among Peruvian and international gourmets. This demand is creating golden opportunities for BOP farmers in the Peruvian highlands. Its cultivation does not require massive investments in technology or even in human resources, and so these shifts in international preference, can add huge value for a region of small farmers. The highlands, particularly Cajamarca, have a long legacy of agriculture and animal husbandry, but not necessarily of innovation in the global economy. Cajamarca, renowned for its potato, rice, corn, wheat and cassava, however, is at the forefront of developing a rare fruit cluster. Indigenous to Peru, goldenberry is by no means a new fruit, but it has only recently experienced acclaim in Peruvian gourmet cuisine and in international markets. This emergence has created an impetus to not only expand production, but also to organize, streamline and maximize a new and potentially competitive cluster. Historically, goldenberry has grown endogenously in wild orchards, but was not cultivated industrially. Today, there are more than a dozen companies, mostly SMEs in the Lambayeque region, developing the goldenberry cluster. Some make raisins, others make jam, spirits, or juices, and new entrants are investigating potential in the organic, pharmaceutical and cosmetic sectors. The “boom” has lead to a greater need for goldenberry production and catalyzed demand for value chain products and services such as wires, poles, nets, baskets, containers, transportation, consulting, professional, technical, labor, and vendors – to name a few. The small farmers who predominate the region have found diverse income streams in small processing plants that have sprouted up, as well as in pruning and harvesting jobs. This has been particularly beneficial to low-income women, who are participating in this market. Nevertheless, the region has struggled in lacking the technical and market expertise to maximize the development of the sector. Here, with Technoserve and the USAID Farmer-to-Farmer project, I have had the good fortune to work with young professionals who are helping to fill this vacuum: Alejandro Otoya and Hans Gutierrez, of Agro Quri. These entrepreneurs sensed goldenberry’s huge potential more than four years ago and wondered how they could standardize superior quality and mass produce on a broader level, while creating jobs at the base of the pyramid. 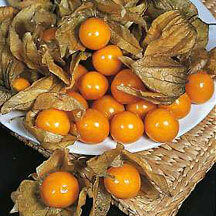 (Above: Enjoying Peruvian goldenberries. I can personally attest it far exceeds its other exporting competitors when it comes to flavor). “After three years of research, we obtained a high quality fruit, golden color (which is required by the export market), delicious flavor, texture and aesthetics, down to the cocoon that covers, which is also very decorative,” says Otoya. The entrepreneurs lunched Agro Quri with a mere two acres and a host of local farmers in Cajamarca. Otoya notes that the local farmers were reluctant at first; lacking confidence that goldenberry could be lucrative. In fact, one of Agro Quri’s greatest challenges was dealing with resistance from local farmers to abandoning the conventional structure. Financial investment went hand in hand with dialogue and cooperation to gain trust and buy-in from the local farmers, who eventually formed the association. The entrepreneurs began by introducing and financing drip irrigation systems and staking systems that lengthen the plants in matrixes with galvanized wire. “With staking systems, the plant can grow two feet unlike wild plants that are expanded and do not grow much. With this technology, the culture adapted to the conditions of the mountain to get an output of 15 kilograms per plant, versus the average seven to eight kilograms,” said Otoya. Today, Agro Quri’s investments have paid off handsomely. It now produces enough to supply more than two tons per week of fresh goldenberry to national supermarkets, creating incomes for hundreds of local farmers. Looking ahead, the young entrepreneurs are unrolling plans to create a processing plant and are beginning to eye the export market. Colombia and Zimbabwe lead only a handful of countries that produce goldenberry globally, but they already have advanced their agrarian technologies and export logistics. Alejandro, Hans and rest of the goldenberry producers in Peru also must master the next step in the chain and hopefully help Peru carve its niche. Peru’s reputation (although probably not undisputed) as the culinary capital of South America and growing global demand for Peruvian specialties can be huge assets in branding Peruvian goldenberry. By doing so when exposure is still new, consumer preferences can actually be in Peru’s favor. I personally have tasted the Peruvian goldenberry and can attest it far exceeds its other exporting competitors in flavor. So Alejandro, Hans and the rest of Cajamarca have one less consumer to convince.